With 13 riders from 6 different countries, the SEG Racing Academy may look like most professional cycling teams. However, the goal of the team management is different than simply winning races. “At the SEG Racing Academy, we focus on talent development,” says Academy Manager Bart van Haaren. “By development, we mean to produce professional cyclists that are ready to compete at the top level at all aspects.” Young riders, eager to prove their talent, require a different type of coaching than a seasoned veteran. For the staff of SEG Racing Academy, nurturing that talent takes the right people with the right tools to make the right decisions. The SEG Academy is supported by the SEG Cycling Agency, (representing riders like Wout Poels, Dan Martin, Niki Terpstra, Sep Vanmarcke, and many others). The Agency works to have the overall vision for each rider, know their strengths and weaknesses, and create the right plan. By combining forces between the Academy and the Agency, SEG makes sure they focus on the talent development process so every rider can make the best out of his capabilities. With varying levels of experience, ability, and hopes, helping these athletes achieve their dreams is no easy task. That task falls on several coaches and managers at SEG. Along with van Haaren, Performance Manager Michiel Elijzen and four Performance Coaches plan the training, run the logistics, create the strategies, and perform all the intangibles that help these athletes continue to improve. Developing 13 different riders is a challenge. With varied goals and abilities, it is critical for the SEG coaches to quickly understand what makes each rider progress. These riders have a limited window of opportunity to catch the eye of the bigger teams. The more effective their training is, the more they progress, and the more chance they have of making the jump to the World Tour. These young riders understand that the more they know about their own bodies and the training they are doing, the more they can work effectively towards their goals. 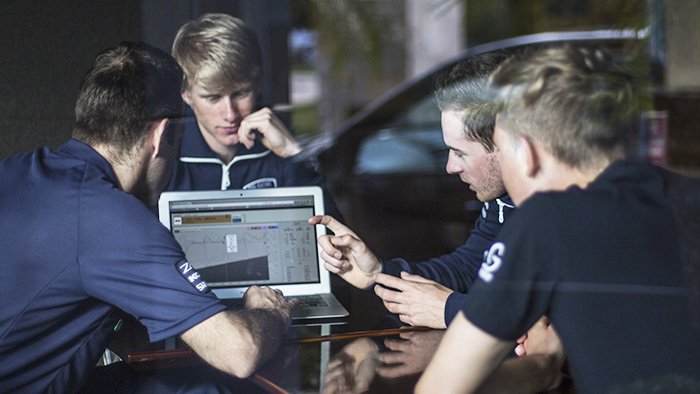 Rather than simply having coaches tell them what to do, many of the riders on the team have taken a keen interest in learning how to better use their data and analyze their own power. “We have the privilege to work with some really intelligent riders this year who like to explore all the options that TrainingPeaks can offer,” says van Haaren. “Some even challenge our trainers sometimes by asking trivial questions about their power files. This is exactly what we want, because by doing so, the riders get a better understanding of the trainer’s philosophy behind the training. This allows them to acquire a better understanding of the points that training focuses on.” Learning how to utilize their data gives the athletes more ownership of their future, and gives them a way to continue to grow even after they leave the SEG Racing Academy. This type of daily feedback loop builds trust in the riders that the team is doing everything they can to help them succeed. “The contact between the trainer and the rider becomes more personal in this way, and the riders feel that the trainer is always by his side to analyze their training and respond immediately to their individual needs,” say van Haaren. It also helps the team run efficiently. “At the end of the day, the features in TrainingPeaks saves us a lot of valuable time and resources,” comments van Haaren.